Wednesday and Thursday, 5 p.m. to 11 p.m.; Friday and Saturday, 5 p.m. to 12 a.m. When Mark Scialdone retired after 20 years with the City of Rochester Fire Department, he dreamed of switching gears and opening up a bar and bistro. A friend asked him to be a partner at Anthology, the East End concert hall that opened in 2015. Scialdone agreed, and dove into renovating the space at 336 East Avenue. But his original idea never went away, he says. With the May opening of Bliss, a new wine bar at 320 East Avenue (a stone's throw from Anthology), Scialdone is returning to a long-held vision. Located in the heart of the East End dining and nightlife scene, Bliss bridges the gap between dinner time and party time with an up-tempo vibe and a flexible menu of small plates, desserts, and wine. "I don't want it to be the average wine bar," Scialdone says. "It's going to be more hustle-bustle, a little louder." He adds that he expects Bliss will appeal most strongly to women, couples, and professionals in their mid-30s and 40s -- patrons who have outgrown the area college bars and clubs but still want a night out. 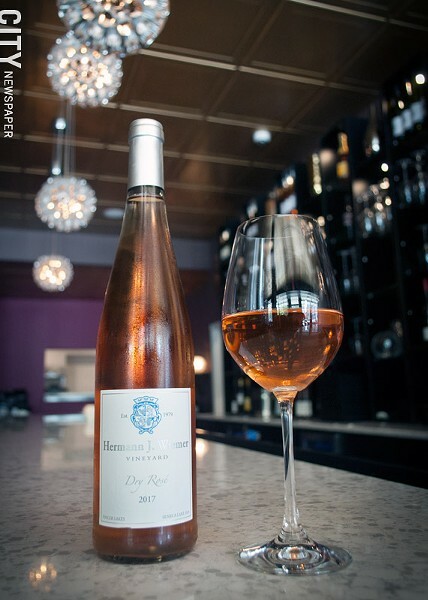 On the list at Bliss: Hermann J. Wiemer's crisp and juicy2017 Dry Rosé. The centerpiece of the space is the wide, L-shaped bar, backed by towering shelves of gleaming glassware and carafes; but there are also a number of quieter, two-person tables for those seeking a more intimate experience. Outdoor seating is available during the warmer months, and the floor-to-ceiling windows at the front of the space slide open onto the sidewalk when the weather is fair. Scialdone himself doesn't claim to be a wine expert, and says he intends for Bliss to be accessible for visitors with any level of wine knowledge. The wine list was developed by Drew Tschäppät, wine director at Farmer's Creekside Tavern and Inn in Le Roy, and who is acting as a consultant at Bliss. According to Scialdone, Tschäppät looks for unique "wines with soul" that can't be found at other bars. The extensive and eclectic list includes selections from Finger Lakes producers Hermann J. Wiemer and Red Tail Ridge, as well as from wine-producing powerhouses including Bordeaux and Napa Valley. The menu also features wines which hail from less-celebrated regions such as Swartland, South Africa and Dundee Hills, Oregon. And for those who truly want to celebrate in style, there is one bottle of the Krug Clos du Mesnil 2002 Champagne in stock. (Yours for $3,200). Bliss will also serve beer, cocktails, and soft drinks, but Scialdone intends to keep the focus on wine. "We don't want to get too far away from who we are," he says. If you're feeling peckish, Bliss offers a rotating menu of both sweet and savory small plates. In addition to house-made desserts like fried ice cream and gluten-free chocolate cake, heartier menu items like beef tenderloin tacos and cauliflower crust pizza can easily be your dinner. "People want something more substantial to eat when they're having wine," Scialdone says. I visited Bliss on a Friday night in May, soon after the bar had opened. My companion and I parked ourselves on two plush, upholstered high-top chairs at the bar and remained there comfortably for the rest of the evening. With its deep eggplant-colored walls, gilded ceiling, recessed lighting, and tropical house music throbbing in the background, the vibe was moodier and more indulgent than that of other wine bars I've patronized -- a sort of contemporary way station between bistro and nightclub. Bliss's charcuterie board is loaded with three types of meat, three types of cheese, bread, olives, gherkins, and mustard. I started with a light and citrusy Chenin Blanc from Swartland, South Africa. My companion ordered the 2016 Michel Guignier Gamay from Beaujolais, which was so warm and silky I had to order a glass for myself. We ended the night with a local selection: Hermann J. Wiemer's 2017 Dry Rosé. Crisp and juicy, this could be the wine you'll be drinking all summer. 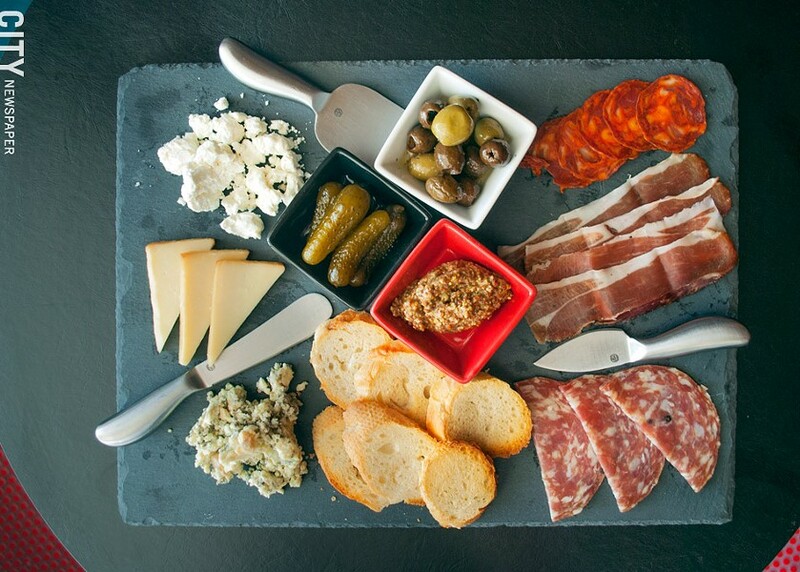 We paired our wine selections with Bliss's charcuterie board, a hefty slate loaded with three types of meat, three types of cheese, bread, olives, gherkins, and mustard. The generous array provided plenty of opportunity for mixing and matching with our wines. Bliss offers wines by the glass $10-$14; bottles $32-$3,200; small plates $9-$23; desserts $7-$16. Happy hour specials from 5 to 7 p.m.